Nokia Philippines has just released one the ASHA series, the Nokia ASHA 210, unleashing its simply and classic design that is suitable for casual usage like longer hours of calling, texting, and simple entertainment. Nokia ASHA 210 is also bound for fast file sharing using its bluetooth technology, since no pairing of devices needed, although your quite vulnerable in malicious attacks. Nokia ASHA 210 is proud for their fast switching Dual SIM capability, using the 3 cellular networks simultaneously is just a piece of cake. Integrated with Facebook key for fast Facebook navigation in one click. 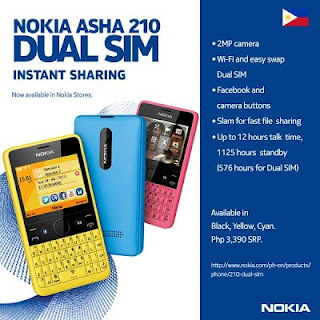 Nokia ASHA 210 is now available in the Philippines Nokia Stores nationwide, and the suggested retail price of Nokia ASHA 210 DUAL SIM is just Php3,390. More Nokia ASHA 210 specification below. Nokia ASHA 210 is priced at Php3,390 SRP. Available now in authorized Nokia stores Nationwide. Overall Nokia ASHA 210 has still some unique features compared to other brands, and we all know how user friendly their UI is, some of its unique features are Nokia Xpress Browser, which is a cloud base technology of Nokia that lessen bandwidth consumption up to 90% suitable for your limited data plan. Another feature of Nokia ASHA 210 is a web app called Nokia Nearby that lets you find restaurant, theaters, coffee shops, shopping, ATM machines, etc.